If you were to Google “Black Widow” nowadays, you’re going to get a whole lot of pictures of a leather clad, red haired super hero beating up bad guys with the rest of the Avengers. But never forget where this heroine got her name! The Black Widow spider is extremely venomous and capable of delivering a potent neurotoxin in self-defense. 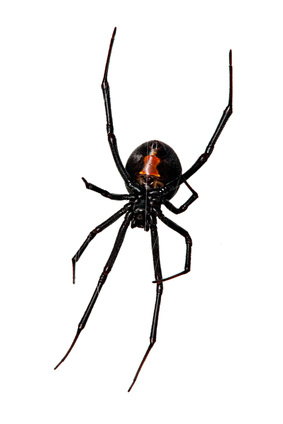 Because of how terrible their bites can be, let’s look at how to identify a female black widow spider in your home. Female widows are twice the size of their male counterparts, and typically grow to about ½ inch in body length, not including the legs. All female black widows have a distinct hourglass shaped red spot on the underside of their abdomen. The easiest way to quickly identify them is by their shiny exoskeleton. Black widows mature in 2-4 months, and their distinct shine and coloration usually sets in then. A female widow can lay anywhere between 400 and 900 eggs in a single papery sac at a time, and usually produce around 9 sacs a season. Don’t worry about black widows conquering the world in their vast numbers, though; no more than 12 spiderlings survive this process due to cannibalism. (GROSS). underside of female Black Widow Spider. I am sure you’re asking yourself, “But wait! If they’re shy, then why do they bite people?!”. The truth is that a black widow will not bite out of being aggressive, but out of self-defense! The most common scenario that people get bitten is when they unknowingly disturb a black widow’s nest and make contact. The bite feels like a pin prick, so it would be easy to dismiss it until the neurotixic venom sets in, causing a set of symptoms known as latrodectism. The impact of a bite depends on the age and health of the victim, and the amount of venom that was injected. Local swelling and redness at the site. Intense spasmodic pain, which can travel throughout the affected limbs and body before settling in the abdomen and back and mimics the pain of appendicitis. If left untreated, can also result in tremors, convulsions, and unconsciousness. The best precaution you can take is to avoid coming across the spider to begin with. Make sure to wear gloves and be mindful of spider webs when working outside. Be safe!